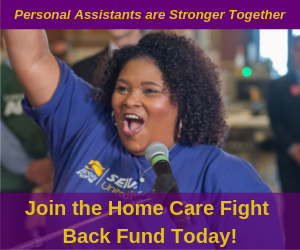 It’s Time to Raise the Wage for Home Care Aides! This legislative session, our top priority in the home care division of our union is to win a raise for EVERY Illinois home care aide. Home care aides have gone far too long without a meaningful raise after four years of Bruce Rauner’s leadership. That’s why we are working as hard as we can to pass our bills – House Bill 2776 and Senate Bill 2019 – that would ensure every Illinois home care aide earns at least $13 per hour. Quality care for our seniors starts with quality jobs for home care aides. But, right now the average Illinois home care aide earns only $11.08 per hour – NO ONE can survive on that, much less support a family. That’s why turnover rates are so high in all of our agencies. If our state invested in these jobs like we should, we would not be facing a 35% turnover rate. And when there’s a revolving door of caregivers it really hurts our seniors too. It’s true that our state is facing financial challenges, but there are plenty of resources to fund good home care jobs and it all comes down to priorities. It’s up to us to force those in power to make investing in this program the priority because home care aides shouldn’t be forced to live in poverty and seniors shouldn’t be forced into nursing homes. Chicago Home Care Town Hall Meeting: Thursday, April 25 at 6 p.m.
South Suburban Home Care Town Hall Meeting: Thursday, April 25 at 5 p.m.
Our union believes that every Illinois home care worker has a right to a good job with decent benefits, and should be respected for the important work that they do each and every day. We also believe that every Illinois senior or person with a disability that needs home care services, should have access to them. That’s our vision for the future of home care in Illinois and step one is passing our bill this session to get every home care aide to $13 per hour. We have an important update about the class action grievance affecting Help at Home Illinois workers regarding the $.73 raise we won back in December 2017. Help at Home management messed up the raise when they implemented it on workers’ checks. Some workers got the correct raise, but many workers got a small part of it and in some case, some workers did not get any part of the raises. After pushing our class action grievance for the past 1.5 yrs and pressuring HAH, we now have a confirmed arbitration date set for May 21! This means we get to state our case to an arbitrator. We believe estimates of back pay are in the hundreds of thousands of dollars, but we are still working very hard at arriving at clear estimates. Stay tuned and hats off to our HAH workers who have been diligently staying connected to this fight! MINIMUM WAGE: In February, Governor Pritzker signed a bill that puts our state on a path for a $15 per hour minimum wage by 2025! It’s a huge victory that many SEIU members played a role in achieving. We rallied, lobbied, shared our stories in the media, and even risked arrest for years to get this done and we made history by becoming the first Midwestern state to pass a bill that will raise the wage to $15 per hour. This will impact over 1 million workers right away when the first increase goes into effect and that’s very good news for our communities. It’s also important for home care aides even though it may not impact our pay right away – that’s because it gives us leverage as we fight for our raise in the state legislature. With a governor and General Assembly that supported raising the wage to $15, home care aides can demand higher wages right now for the important work that we do. FAIR TAX: Governor Pritzker also made another one of our issues a top priority to get done this year and that is taking the first steps to enact a Fair Tax in Illinois. Our union has long supported a Fair Tax because we know that the millionaires and billionaires should be paying more than home care workers and other low-wage workers. Right now, our income tax structure isn’t fair and it robs us of the revenue we need to be able to fund priorities like good wages for home care aides and expanded access to home care services. This session we’re ready to do the work necessary to make sure that the wealthy finally pay their fair share in Illinois. It will take a constitutional amendment to ultimately implement a Fair Tax, but the first step is for the General Assembly to take action this session. We will be in touch with everyone as we have more updates and ways to get involved in that campaign. IMMIGRATION JUSTICE: Our union is supporting bills in Springfield that aim to fight against building more detention centers that house immigrants fleeing violence and poverty this session, and we’re also supporting a bill that will continue to keep immigrant families together. We’re proud to stand up on these issues and other racial justice campaigns because as a union we are committed to winning social and economic justice for everyone in our communities. No matter our differences, white, black and brown working people just want to do better for our families. Our strength comes from our ability to work together and that’s why we must stand up for each other and unite to fight for the future we all deserve.